This post is about things that go ‘bump in the night’. No, it’s not really. It’s about an illustration that I produced from some photographs and sketches that I did in the garden. 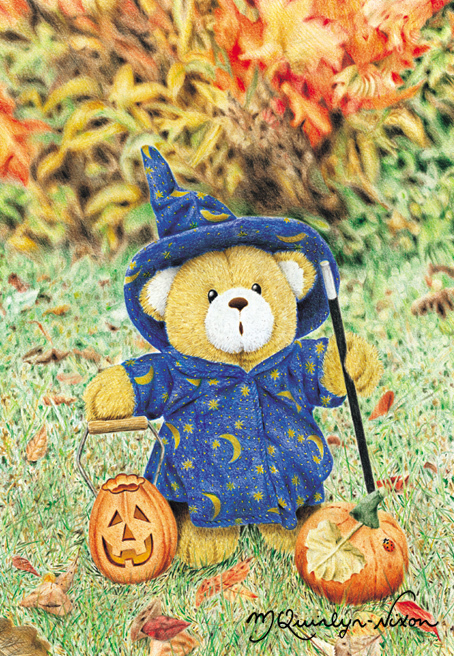 I spied this wizard bear (which I thought was rather like an ursine version of Harry Potter) in a local shop. 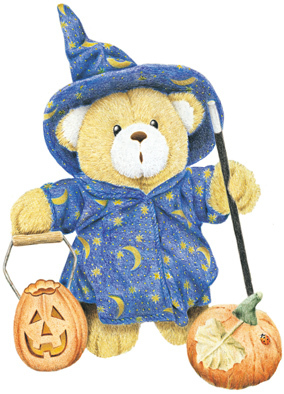 I named him ‘Hector’ and could tell that he would make a cute illustration for the calendars and cards I was producing. Selecting an autumnal part of the garden (luckily it was autumn), and with the addition of some specially selected branches and leaves – of gold and vermilion – I set the scene. This drawing was quite difficult, as after drawing nine blades of grass in minute detail I start to go a bit stir-crazy. I have even seen me go to the kitchen sink and wash a pile of dishes, rather than draw and shade one more blade of grass… The wizard’s gown and hat were quite an ordeal too, as the gold dot, moon and star pattern kept getting tarnished by the ultramarine and indigo blues surrounding them. I loved the jack-o’-lantern and pumpkin that I used in the picture. I ordered them especially for this illustration from a up-and-coming teddy bear company in America. In fact, I liked them that much that I purchased several of them to get the very one I wanted. I realise a lot of people look at my illustrations, some with disinterest (you can’t please everyone), but others say ‘That’s nice’, without realising the amount of hours – setting the scene – dressing the bear – finding the props – and then the laborious hours spent at the drawing board. However, during the time I was creating the teddy bear illustrations there were a number of customers, who would point out certain details, saying ‘The details here is marvellous, do you incorporate photography into your illustrations?’ Comments like that made all of the hours spent drawing a lawn, or whatever, seem SO worthwhile. I dedicated this picture to my friend, Tracey A. Dixon, who greatly appreciated it, so much so, that I believe she owns the original illustration and Hector too! On the feast of Hallowe’en. Remember you’re a big brave bear!